Nothing separates the leaders from the followers, mofe than their commitment to excellence as well as the ability to foresee and capitalize on future prospects. In this, Ansals have always specialized. First, it was Delhi's towering commercial buildings. Then, full-fledged townships bordering Delhi. Each project, perfectly tuned, in keeping with the emerging demands. And now, following the overwhelming response to Sushant Lok II and the outstanding success of Navkriti Arcade shopping complex here, Ansals launch their second commercial landmark in this township - Sushant Tower. The towering 8-storeyed complex that will give you the ultimate power to explore the unlimited potential of Sushant Lok II as well as colonies around. 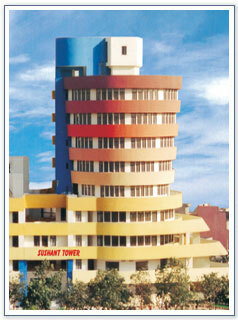 Enriched with excellent feature and values, to beckon corporates for a fine business venue Sushant Tower is the answer. Ground & first floor - for Shops, second to eighth floors for Offices. Contiguous office space with attached toilets and balconies for companies / corporates houses.